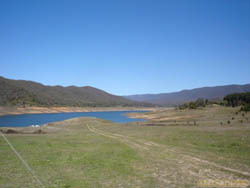 This is an easy drive to a great camping spot by the Blowering Dam between Tumut and Talbingo. There is plenty of space to camp and there is also a boat ramp. My track file starts from Tumut and goes to Cannon Bay via Talbingo, then back to Batlow and Wagga Wagga.